Volunteers - please fill out our survey form. Friday, March 15. 2019- River Center, 136 E. Third St., Davenport, Iowa. Doors open for the luncheon at 11:00am. This is the beginning of The Grand Weekend with the introduction of the Irish Mother of the Year and Grand Marshal of Grand Parade. Also on the agenda will be St. Patrick Society scholarship awards recipients. This event will kick off the big weekend and will include musical entertainment. 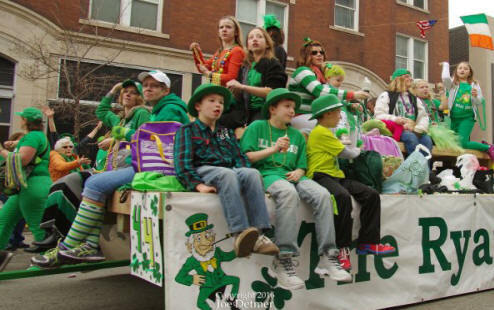 Saturday, March 16, 2019 the Grand Parade XXXIV commences with 10:00 Mass at St. Mary's Church in Rock Island, Ill. 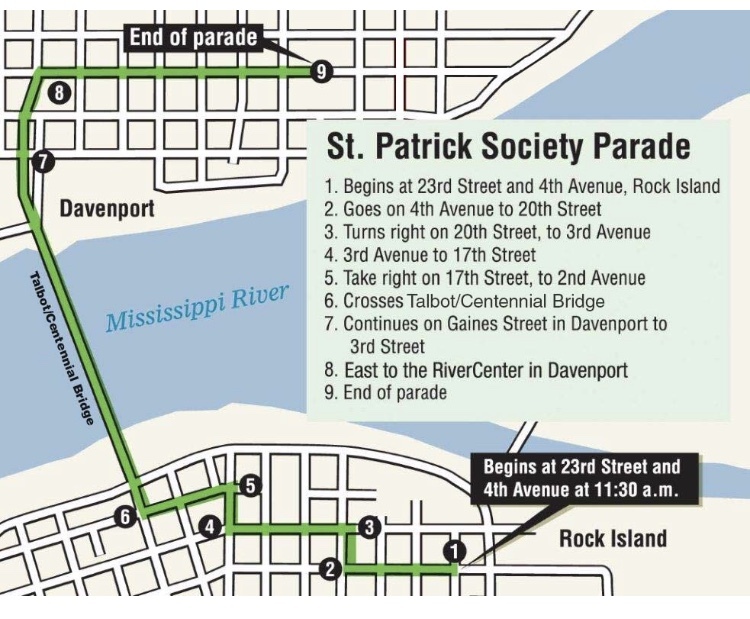 The Grand Parade begins at 23rd St. and 4th Avenue, Rock Island, Ill. proceeds through downtown Rock Island, Ill. and crosses the Mississippi River to downtown Davenport, Iowa. It starts at 11:30 and ends at 1:30pm. See a map of the parade route here. Saturday March 16. 2019 River Center, 136 E. Third St., Davenport, Iowa. The St. Patrick Society Post Parade Bash occurs after Grand Parade. Doors open at 1:00 pm. For questions or comments about The Bash email info@stpatsqc.com.